While staying in uttanasana, you initially feel all the blood flowing into your head, warming up your face and ears, resulting in a hot tingly feeling and then after a while, a sense of relaxation. On some days, when you inhale while lifting your head to fully stand up, you feel slightly off balance and dizziness. This is a common feeling of head rush. What happens while lifting your head to fully stand is that the blood tends to rush suddenly away from the head, resulting in a sudden change of pressure from high to low. Whilst this scenario is commonly known as a head rush, for some it may be due to a medical reason of low blood pressure or hypotension. Hypotension is a measure of diastolic pressure* of less than 60 mmHG. Therefore, if one suffers head rush in Uttanasana, do not lift to stand immediately, but lift yourself into Ardha Uttanasana and stay for a few breaths before fully standing up. Whereas for a person with hypotension, do not drop your head to look towards your legs, instead look to the ground, then release into Ardha Uttanasana before standing up. On the other hand, a person with hypotension needs to increase their blood pressure by increasing their heart beat or making their heart work harder. The few ways to do that is to do some cardio exercises, have a more dynamic yoga practice and to practice more inversions ( get used to the passive poses first ). Blood pressure is a measurement of the force against the walls of your arteries as the heart pumps blood through the body. Arteries are vessels that carry blood from the pumping heart to all the tissues and organs of the body. Since there are two types of circulation ( pulmonary* and systemic* ) in our cardiovascular system, it is best to mention that someone who has a blood pressure problem is talking about the pressure in the arteries of their systemic circulation. High blood pressure is a risk for heart disease because the heart is working harder than normal thus putting the heart and the arteries under a greater strain. When the heart is forced to work harder for long periods of time, the heart becomes enlarged. Very high blood pressure can also cause arteries to bulge of burst. Uncontrolled high blood pressure can lead to stroke, heart attack, heart failure or kidney failure. This is why high blood pressure is often called the “silent killer“. The only way to tell if you have high blood pressure is to have your blood pressure checked. 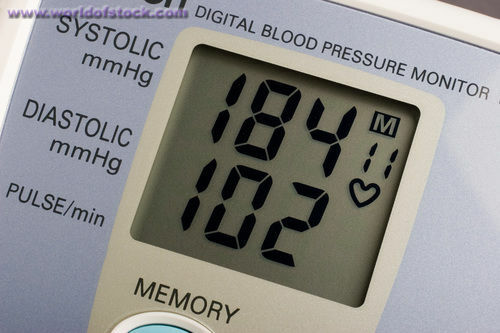 The level of normal blood pressure is below 120/80 ( 120 systolic* / 80 diastolic* ). High blood pressure is a measure of the diastolic pressure. One should be wary if diastolic pressure is above 80. According to HealthSTATS International ( a privately held Singapore-based technology company with principal activities in research & development for hypertension and related illnesses ), approximately 1 billion people worldwide have high blood pressure, and this number is expected to increase to 1.56 billion people by the year 2025. That translates to about 1 out of every 4 adults being afflicted with hypertension. The usual causes of high blood pressure is related to stress, lack of exercise, unhealthy food choices and obesity. One of the many ways to reduce blood pressure is to eat healthily, improve on work conditions and to practice yoga asanas. But bear in mind that not all yoga asanas are safe to practice when your blood pressure is high. Special caution have to be given when choosing to practice inversion poses. Finally rest in savasana . When students are comfortable with the above poses, they can be done without props. Then, it may be possible to move on to poses in which there is increased pressure in the neck and head such as halasana , salamba sarvangasana and dolphin. Extra care has to be given for those with high blood pressure who want to attempt sirshasana as there will be maximum pressure in the head. A good guide is to move into the pose gradually and remain only if the breath is not strained ( unstrained breath comes with a relaxed abdomen ). Additionally, try to keep the face, neck and throat relaxed.